Four platform configurations allow the Orbit 1000 Digital Shaker to meet a variety of shaking and mixing applications. 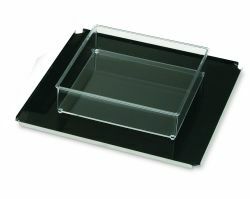 Single and double flat platforms hold trays, plates and dishes. The double platform allows for expansion of the shaker capacity without increasing the footprint. The universal platform has spring loaded bars that adjust to fit flasks, bottles, tube racks and odd shaped containers. 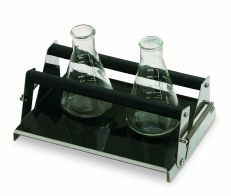 Predrilled to hold Erlenmeyer clamps (clamps sold separately), the flask platform is ideal for mixing and growing cultures. Platforms are removable and interchangeable. At the heart of the Orbit 1000 are a powerful brushless motor and counter balanced shaker mechanism that provide smooth operation and years of trouble-free use. Speed and time are set with an analog knob, while the set and current values are displayed digitally. Speed is adjustable over a broad range to allow for applications such as staining and destaining gels, growth of bacterial cultures and hybridization. 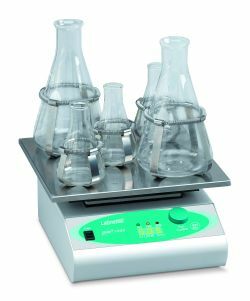 The Orbit 1000 Digital Shaker is safe for use in temperature controlled environments. Its small footprint and low profile make it ideal for use in incubators. Platforms sold separately.